Sift the flour into a large bowl, add the salt and the sugar and combine well, add the soft butter. Dissolve the yeast in a little bit of milk and let proof for a few minutes. Add the mixture, the rest of the milk and the egg to the flour and stir the ingredients from the middle. Once it all starts coming together and knead the dough until it is very smooth and elastic. Cover, set it at a warm spot and let rise until it is doubled in volume. Then roll it out into a rectangle to approximate 3 mm thickness. Combine the almond meal and the sugar in a bowl, add the finely grated apple, the lemon zest and lemon juice and combine well. Add the cream and stir until everything is well combined. 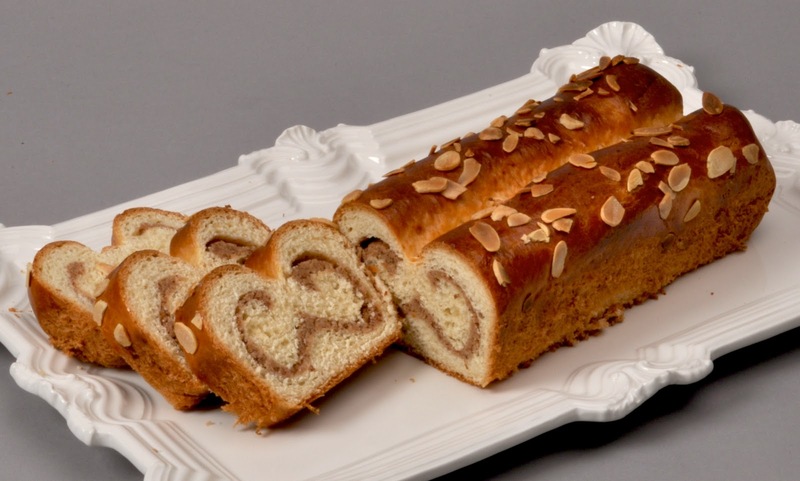 Spread the almond mixture evenly over the rolled out dough, leaving only a small edge. Then roll the dough from both sides toward the middle and place in a prepared 13 to 15 inch cake form. Brush with the reserved egg and sprinkle with some slivered almonds. Let rise again, then bake in a pre-heated 425 F/ 220 C oven for about 35-40 minutes. ** if you like the tart/sweet flavor of apricot preserve, spread the apricot preserve on the rolled out dough before you spread the filling. Also if you like you can glaze the baked, still hot bread with a sugar glaze. You'll need 100 g powdered sugar, 1/2 tbsp lemon juice and 1 tbsp water. Mix and brush the baked bread with it.